Almost for a decade now, mobile apps have become a kingpin of innovation. With the growing market of smartphone devices, most of the organizations are adopting ways to incorporate mobile apps in their business flow, in order to enhance their market outreach. For the development of mobile app, the organizations have to do detailed planning about various types of processes. Well, before going for app development, you have to decide upon the way in which you would like to create and deploy the app. During the preliminary research for the development of mobile app, you might have found couple of ways. 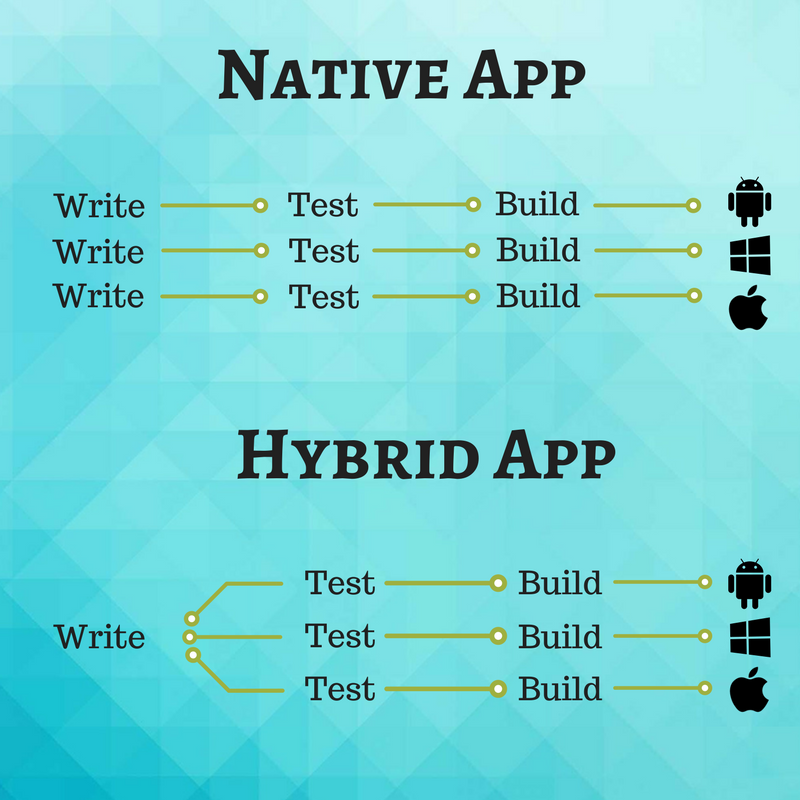 For the better decision, let us take a look at the differences between hybrid and native app; along with some new innovations such as progressive app. Also, we will have a look at the pros and cons of the two, to help you understand which approach will be best suitable for your app idea. Before proceeding with the explanation as to which approach would best suit your organization, we would like you to ponder over the consumer reactions to poor experience of mobile app. 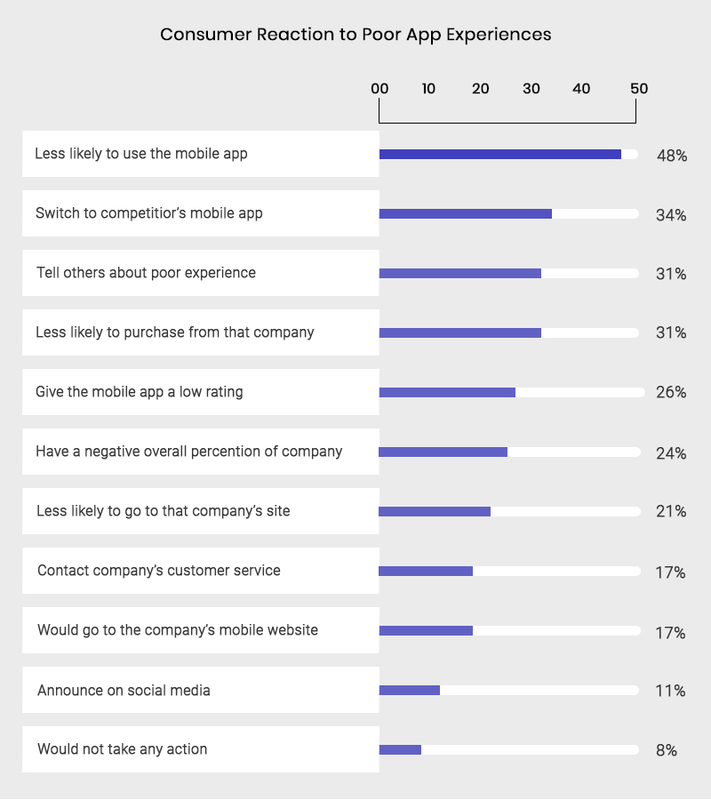 The user reactions about mobile app tell us about their engagement with a company when their experience is not so good. Now let us brief you about hybrid and native apps along with their pros and cons. A native app is a program that has been coded in a specific programming language, for devices having specific OS. For instance, Objective C is used for iOS or Java for Android Phones. These apps can take advantage of OS features and other software tools that are installed on that platform. They also have access to various phones functions such as camera, gallery, contact list etc. Mostly Native apps are compiled into machine code. These provisions help native apps perform the best in a mobile device. The native development is easy and there are innumerous resources available, but it might not be understandable to everyone. Since the code has to be written specifically for each platform, it has to be rewritten for each one. Only the logic remains same but the language, APIs and the development process might be different. Sometimes, this process becomes quite long for complex applications. Since these apps can be built only for a particular OS, a company or organization is required to make duplicate versions of the app, so that it can work on various other platforms. For example, the video games for mobile devices are mostly native mobile apps. Hybrid apps take least amount of time to develop and are developed at a fairly cheaper price as compared to native app. Building a hybrid app means maintaining just one code whereas with native code you need an app developer for each platform. But this does not mean that native apps are bad because they have their own advantages. Native apps provide the best user experience because they are specifically designed for a single app store, with which one can get the best compatible apps. The screen size is taken care of and so the hardware capabilities. With Hybrid apps it is impossible to provide a good experience with just 1 application code for all platforms. Since native apps have the best UI hence paid apps are usually advised to be developed as native apps whereas free apps can be developed as hybrid apps. Native and Hybrid Applications have their own pros and cons as we have already discussed in the post. The decision about the choice of app depends largely on the requirement of the organization. After heeding upon the requirement options, it is advisable to work with the app developers, who will be going to bring your ideas to life in an efficient manner. It is better to outsource the app development rather than having a permanent in-house setup. Also, working with an outsourcing team could make your mobile app development feel like a natural transit. At Cagist Malaysia, we can help you choose the right app for your idea. If you would like to share your views on future of mobile app development, leave a response – we would love to chat with you.